Spring Missouri Valley Wrench Club Wrench Club Meet & the Wrenching News Antique Wrench Auction at the City Auditorium, York, Neb. Friday 7:00 A.M. (York City Auditorium, 6th & Nebraska Avenue - York, Nebraska) - Doors open for the MVWC Spring Meeting - Show and Swap Meet. Friday 10:30 A.M. (York City Auditorium) - Missouri Valley Wrench Club Business Meeting. Friday 12:30 P.M. (York City Auditorium) - The Wrenching News Spring 2015 Antique Wrench Auction begins. Auction is open to the public. Friday 7:00 P.M. (The Tommy-Suz Garden Room at the Chances "R" Restaurant, 5th and Platte Ave. - York, NE) - Banquet for members and guests. Saturday 8:30 A.M. (York City Auditorium) - Wrench Auction Resumes (sale will start with Lot No. 1). Herb Page the author and publisher of "The Brothers Coes and Their Legacy of Wrenches" has given The Wrenching News the opportunity to add his excellent book to our inventory of books for wrench collectors. For a review and ordering information Visit the Wrenching News Book Store. If you have any interest in Deere Company wrenches I highly recommend you acquire a copy of Dan Chopiak's "John Deere and Merged Companies Wrenches and Tools". - Over 600 wrenches are pictured and described in this sixty-nine page list. The pages are in protective sheets in a three ring binder. As it as been over ten years since Wayne Dill's last John Deere tool list Dan's wrench numbers will be used for reference in future Wrenching News Wrench Auctions. The list will be updated whenever they are enough new entries to warrant a new edition. The current 2017 edition is $20.00 postpaid. Contact: Dan Chopiak's - 1664 King Hill Road - Endicott, NY - 13760 - 607-237-1599 - email:dchopiak@yahoo.com"
See the Wrenching News Book Store for prices and ordering information or email or call for details. 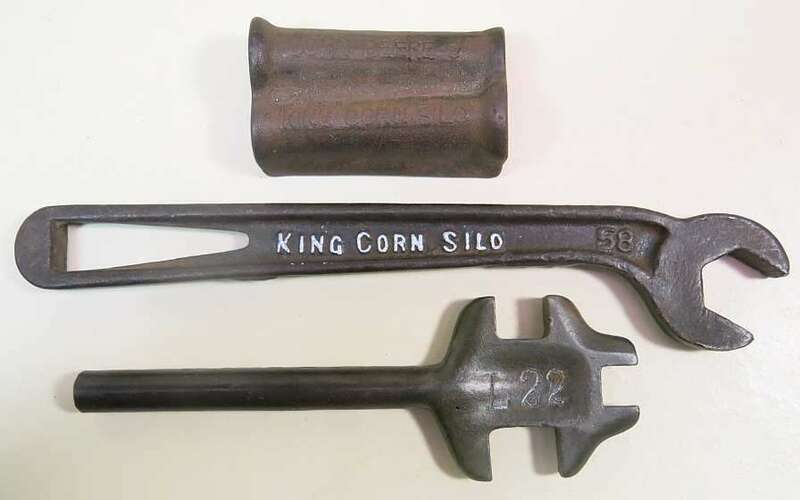 April 2019 -Wrenching News Spring 2019 Antique Wrench Auction - York, Nebraska. Oct. 2018 - 2018 Antique Bill Rhodes Wrench Auction -Marshalltown, Iowa - - Wrench & Misc. Photos - - Seats. Planter Lids, Tool Boxes, Jacks, Etc. April 2018 -Wrenching News Spring 2018 Antique Wrench Auction - York, Nebraska. April 2017 -Wrenching News Spring 2017 Antique Wrench Auction - York, Nebraska. October 2016 -Wrenching News Fall 2016 Antique Wrench Auction - El Dorado, Kansas. April 2016 -Wrenching News Spring 2016 Antique Wrench Auction - York, Nebraska. October 2015 -Wrenching News Fall 2015 Antique Wrench Auction - El Dorado, Kansas. April 2015 -Wrenching News Spring 2015 Antique Wrench Auction - York, Nebraska. October 2014 -Wrenching News Fall 2014 Antique Wrench Auction - El Dorado, Kansas. April 2014 -Wrenching News Spring 2014 Antique Wrench Auction - York, Nebraska. April 2013 -Wrenching News Spring 2013 Antique Wrench Auction - York, Nebraska. April 2012 -Wrenching News Spring 2012 Antique Wrench Auction - York, Nebraska. Sep. 2009 - Wrenching News Davenport, IA Antique Wrench Auction (Wilbur Hall, Doug Bush and Others). The official site for the Missouri Valley Wrench Club by Newsletter editor Stan Schulz. 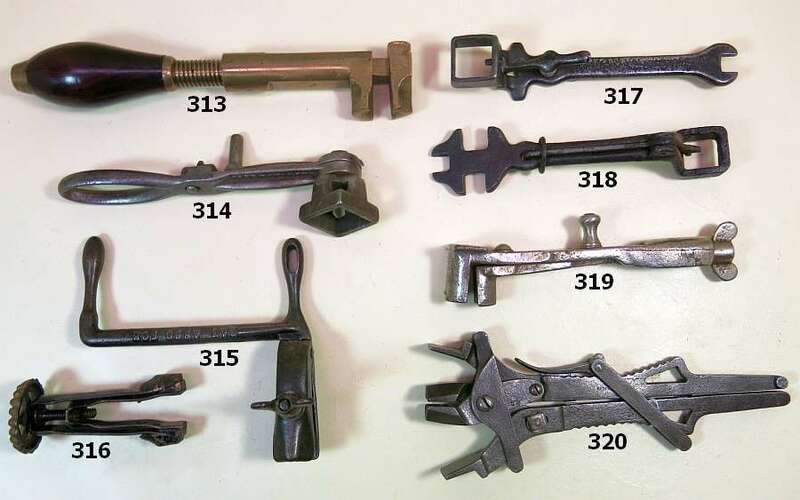 Lots of pictures of Carl's Tool Museum including tractors, gas station equipment, old wrenches, more tool links and an informative page on wrench standard markings found on old wrenches. First-rate site for wrench and other antique tool collectors with a friendly and helpful discussion forum. History and heritage of tools of Australia. Has several pages of wrenches pictured and identified and an extensive "Directory of Australian Tool Manufacturers and Makers"
Note: I upload Gregor's monthly email magazine of antique tool ads and schedule of upcoming events at the beginning of each month a few days after receiving it from Gregor. The antique tool event schedule is one of the most complete on the web and the ads are free to email subscribers. Contact Gregor at Email or phone 817-937-5475 for more information. Mike Urness' site. He manages several tool auctions a year. Mostly wood working tools but most auctions do have a few good wrenches. 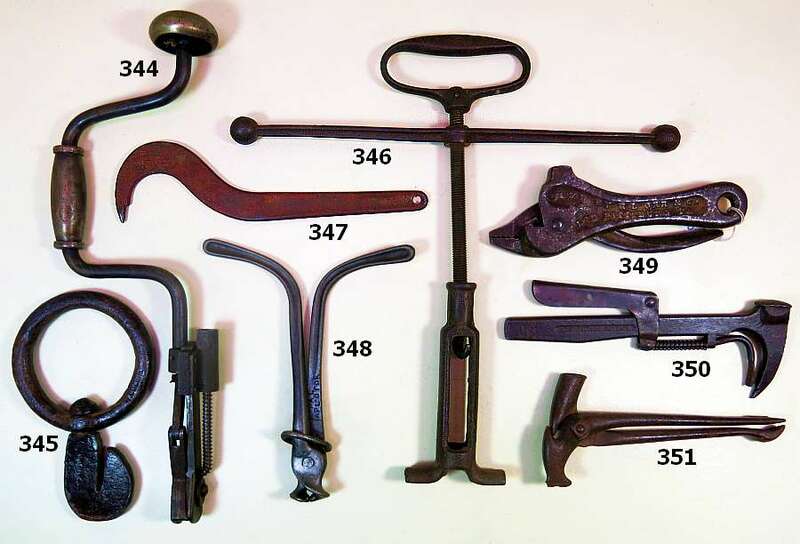 Australia's premier antique tool site. Tools for sale, auctions and more. Randy Roeder's excellent site on Miller Falls products. One of the best laid out and informative sites on old tools I have seen. Tim Melcher's Winchester Site focuses primary on Winchester Store collectibles. Contains an excellent section on Winchester "Fakes" including wrenches. Sure padlocks are tools and most tool collectors have a few (I have several hundred down from over a thousand). Excellent pictures of locks, safes, and advertising items from Dean's collection plus "caveat emptor" Let The Buyer Beware", an excellent section on reproductions. A mostly woodworking tool site from the Lone Star State - Tools, Books, and Manuals for sale with a discussion board and an excellent list of links. This site is continually under construction. Check back often for new additions.